What do 26,000 keywords tell us about the latest Google 7 change and the new Google SERP? As the Google SERP continues to evolve and brands aim to increase their control over search results, the emergence of a new type of SERP has interesting implications for SEO Managers. Since August, Google has been serving for some keywords, SERPs with 7 organic listings, instead of the usual 10 listings as discussed in 7 Is The New 10? Google Showing Fewer Results & More From Same Domain. While this change has caused an expected uproar from many a marketer, a large opportunity presents itself for brands that invest in universal search techniques. Not only can brand sites dominate the Google SERP with multiple results from a single site, but also negative content can be combatted and pushed out of the first page. Now that the ‘dust has settled,’ so to speak, I want to walk you through these changes and explain what this means to a search marketer. These recommendations are based on an analysis of SERPs, using a wide sample of 26,000 keywords across industries including: Technology – B2B, Technology – B2C, Financial Services and Retail. In the below screenshot, you can see that when I type [twitter] in the Google search bar, the Google SERP displays seven, not ten, natural blue link results. The first result has breakout sitelinks. Now, if I type in [Toyota], you see a similar pattern – a set of seven results, with the first result having breakout sitelinks. In addition to the seven organic results, there is a Places pack also with links to Toyota dealerships near my location (set to Los Angeles, California). Page 2 and page 3 look the same in the number of results before and after the change. However, the first result on page 2 is what used to be in position 8 in the older version of page 1. While the observations I made above may be helpful, the real value lies in understanding how widespread this change is and where it occurs. 1. 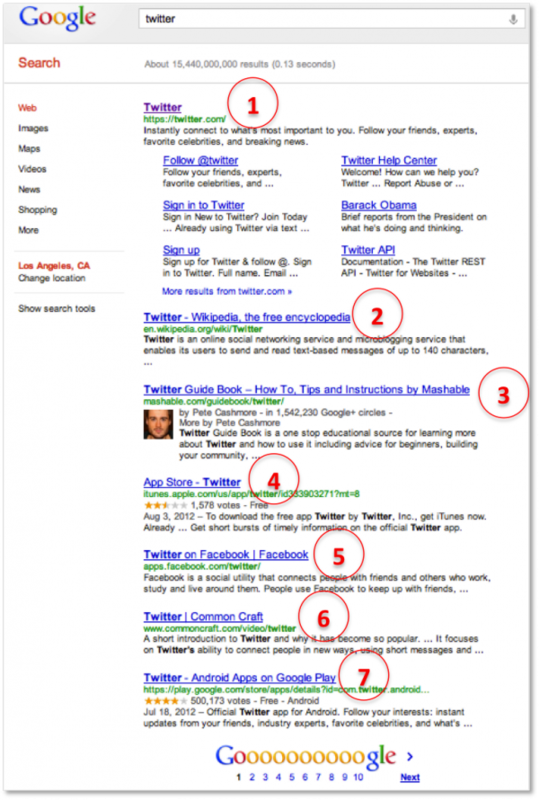 Virtually all keywords with seven results have sitelinks. We noticed that almost 95% of keywords with seven results also have breakout sitelinks. We also found that the sitelinks show up on all keywords that are brand keywords. So, you can expect that all branded keywords – for you and your competition – will now have seven link results. 2. The number of keywords affected increased four times after August 20th. Since the change was first noticed on August 20th, the number of keywords with seven results increased four times. As we monitored the changes, we realized that what started as an experiment by Google was clearly being rolled out on a wide scale and consistently across data centers and regions. At the time of this writing, this change is visible in North America and Europe, and several countries in Asia and South America. 3. With 8% of keywords affected, this change touches more keywords than Panda. The percentage of keywords impacted is currently 8% across the industries we examined. This is significant, considering that a critical update like Panda affected 5% of searches. 4. The number of keywords affected varies by industry. We have found that the impact varies by industry. The Technology – B2B sector has 9.4% of its keywords affected, while Technology – B2C industry sees 12.1% keywords impacted. Financial Services industry has about 2.7% of keywords affected, and about 3.5% of keywords in Retail are impacted by this change. The impact of this change on your traffic and conversions may be significant. This is especially true if you previously ranked between 8 and 10. In this case, without any changes in your rankings, your presence has changed from the first page to the second page. As a result of this, you will most likely see a decrease in website performance. We all know that click-through-rates vary by the page on which the result shows up. Traffic from keywords in positions 8-10 (now on page 2) will decrease. Instead, your traffic will be similar to what usually comes from positions 10-12. Even if you were ranking between 1 through 7, it may be worth taking a closer look at the keywords which are affected. You may just find that you end up with a higher visibility on the first page and therefore, an increase in website performance. Indeed, keywords above the fold will continue to get most of the traffic and might even see an uptick, due to fewer choices on page 1. This is one of the most serious implications of the Google change. Keep two things in mind. First, unless your competitors are greatly ahead of you, they will see equivalent drops. Second, if you realize your keywords have dropped out of page 1, take a closer look to spot what’s behind this change – the new Google SERP or declining SEO performance. It may well be possible that your rank stayed the same, but page 1 simply shows fewer results. Adjust your keyword rank reporting. Pay greater attention to blended search and measure blended rank. If some of your keywords have been impacted, you will need to make adjustments to your keyword reporting. Make sure your keyword tracking technology reflects this. For instance, for keywords with 7 results, positions 8, 9, and 10 should be reported as falling on page 2; for keywords with 8 results, positions 9 and 10 should be reported as appearing on page 2, and so on. If it is not possible to configure your technology to reflect this, ask your technology provider to do so. You may also want to investigate how your technology provider keeps up with Google’s algorithm changes as these changes are becoming more frequent. If you do a lot of reporting outside your tool, or you use Excel for keyword performance tracking, you may have to make these adjustments manually. Beware – this might get a little tedious if you are tracking a lot of keywords. If your keywords are impacted by this change, you also need to recalibrate your keyword goals. Adjust your goals to reflect the ‘new real estate reality’ for some of your keywords. Finding keywords within striking distance should now start with selecting keywords on page 2. In your keyword ranking technology, don’t filter by position 1-10 to find these keywords. Instead, use ‘Page 2’ filters to identify these keywords. The target rank on these shorter pages should be position 7 and above. It is important to note that seven organic results does not preclude universal results from showing up. The screen below shows that a search for ‘Cisco’ reveals seven blue links and a ‘News’ section highlighted by the red box. We saw that the ‘Toyota’ example (at the beginning of this post) displayed Places results too. The presence of Universal Search results, in a SERP with seven organic results, has serious implications for marketers. First, ranking in universal search becomes even more significant since relevant news, image, video, social, and local results take up a greater proportion of SERP real estate. Second, search marketers must measure organic rank as well as their blended rank, which measures rank by taking into consideration all the listings on a page. Tracking rank among the organic text results in the new SERPs is necessary but having blended search strategies and visibility into blended rank increases your ability to dominate page 1. We expect this trend to continue as Google is putting more emphasis on universal results, displaying image, video, social, and local results to make search results more relevant to the user. Read this article to understand why universal search matters to users. To learn more about the significance of blended rank, see Nag Patta’s piece on the BrightEdge blog, SEO is like the Olympics. Another dimension is the Google Search Plus Your World update. With this update, Google signals a greater importance for Google+ pages in the search algorithm and now offers Google+ Local as part of its Google+ initiative. Again, I see this as a special type of universal search and further highlights the importance of ranking in universal search results to grab a greater share of the SERP. Google showing three less search results for brand names on its SERP may seem like no big deal. However, it is. As Google focuses on improving the quality of its search results, brands are presented with a number of opportunities to dominate the search results through more than just blue text links. As with any update, and as documented in this article, results and corresponding strategy and tactics vary by sector. The key takeaway is that Google’s quest for quality and relevancy provides you an opportunity – optimizing your search campaigns across multiple search types, and in multiple formats, puts your brand not just in a position to win, but also to dominate the new Google SERP.